While maintaining the infectiously melodic mix of bluesy rock ’n’ roll and rootsy soul that’s long endeared the three brothers who make up Los Lonely Boys to their fiercely loyal fan base, the band’s latest outing, Revelation (2014), adds an expansive range of new sonic elements—including conjunto and reggae. It’s the band’s first recording since Henry Garza (vocals, guitar) sustained serious injuries in a fall from the stage in 2013, necessitating a lengthy recovery. “The whole experience was a wake-up call for us,” says JoJo Garza (bass, vocals). 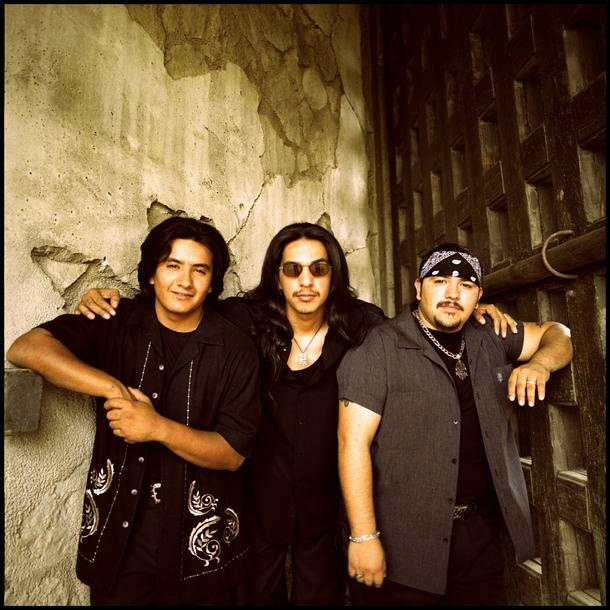 “It made us rethink every aspect of our lives and our careers, and it reminded us of what’s really important.” The abiding sense of family unity and creative rapport that allowed the band to weather such a potentially devastating event has been built into Los Lonely Boys from the beginning. Indeed, Henry, Jojo and Ringo (drums, vocals) have been making music together for their entire lives. Their father, Ringo Garza Sr., was a member of another sibling band, the Falcones, which played throughout southern Texas in the ’70s and ’80s. When that group disbanded, Ringo Sr. went solo, and recruited his three young sons to back him. Soon Henry, Jojo and Ringo Jr. began writing and performing their own material as a trio, recording their debut in 2003 at Willie Nelson’s studio in Austin, with Willie himself guesting on the sessions. Epic Records picked up Los Lonely Boys for major-label distribution in early 2004, and the album quickly won the band a large national audience. Its lead single “Heaven” became a Top-20 pop hit, reached #1 on Billboard’s Adult Contemporary chart, and won a Grammy. The brothers solidified their success with 2006’s Sacred, which brought two more Grammy nominations, 2008’s Forgiven, the all-covers EP 1969, the unplugged Keep On Giving: Acoustic Live!, and 2011’s Rockpango. All the while, the band continued to build its reputation as a singularly powerful live act.